Born a week before Elvis joined the Army, Ian Marchant is originally from Newhaven in East Sussex, and now lives with his family in neither England, nor Wales, but Radnorshire. 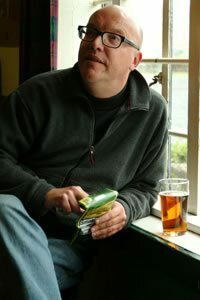 In the 21st Century he has run a large second-hand bookshop on the Charing Cross Road, been Centre Director for the Arvon Foundation at Totleigh Barton, and worked as a lecturer in Creative Writing at Birmingham City University. The travel/memoirs, ‘Parallel Lines’ and ‘The Longest Crawl’, were each selected by Nicholas Lezard as his paperback of the week in The Guardian. ‘The Longest Crawl’ was book of the month for September 2007 in both ‘The Sunday Sport’ and ‘The Church of England Newspaper’, a hitherto undreamt of critical double. ‘Something of the Night’ was published by Simon and Schuster in January 2012 and ‘A Hero for High Times’, will be published by Jonathan Cape in 2018. He co-wrote the play ‘White Open Spaces’ for Pentabus Theatre, which was nominated for a South Bank Show award in 2007 after performances at Edinburgh and the National Theatre of Sweden in Stockholm. For Radio Four, Ian has presented documentaries about talking trees, scary buses, ghost trains, the self-service nation and the history of barbed wire. He has presented three series for Radio Four: ‘A Load of Rubbish’, ‘The Completists’ and ‘North and South.’ For Radio Three, Ian presented the Sunday Feature, ‘Walking with Attitude’. For Radio Four’s ‘Open Country’, Ian has presented programmes on living off grid, the dark side of the Lune, new ways to look at home, and the arrival of politics on the Isle of Gigha. He presented a film for ITV Border about the engineer Thomas Telford in 2007, which was nominated for a Royal Television Society Award, and presented a four part series for ITV Border, ‘Fun For Some’, which was broadcast in April/May 2008. He has written for The Guardian, The Observer, The Daily Telegraph, The Independent on Sunday, The Times, The Sunday Times and Metro. Ian has made numerous appearances as a guest speaker, compere, quizmaster and lounge singer at various festivals, including Hay Literature Festival, Glastonbury, Ways With Words at Dartington, Words by the Water at Keswick, Green Man Festival, Stoke Newington Literary Festival, tEXt in Exeter, Ilkley Literature Festival, Hebden Bridge Arts Festival, Lancaster Litfest, Secret Garden Party, Wilderness, Eden, The Green Gathering, and Abergavenny Food Festival. Ian was one half of Your Dad from 1997 until the death of the other half of Your Dad in 2015. Ian has worked for many years with legendary Bohemian poet Lionel Spume FRSL as biographer, sole agent and literary executor.